An elegant blend of industrial and Scandinavian design inspired by the famous Eames plastic dining chairs made for you. 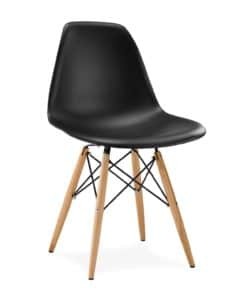 Our collection of plastic dining chairs reproductions inspired by the timeless designs of Charles and Ray Eames will offer something to suit everybody’s taste. 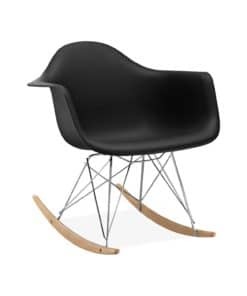 From the classics such as DSW, DSR, DAW or DAR to the iconic Eames rocking chair (RAR), we carefully reproduced all iconic Eames plastic chairs according to the original design specifications in order to ensure the same combination of functionality, style and comfort. Charles and Ray Eames are probably the most famous designer couple of the 21st century. This American duo pushed the boundaries of the mid-century furniture design further with the use of, at the time, cutting-edge manufacturing techniques and newly discovered materials. From their early experiments with molded shapes, the Eames couple always tried to incorporate their experience in industrial design – gained during the war years when they were actively helping the American war effort by working on the industrial production of common necessities – with the core principles of Scandinavian design. 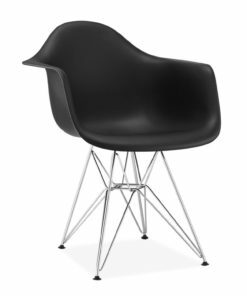 The result is world-famous line of Eames plastic dining chairs which set the standards and revolutionized dinning chair design. The legacy of the Eames’ work is still visible today and here at By Bespoek we aim to preserve this legacy in its fullest. In the post-war era, Charles and Ray Eames applied their acquired knowledge and skills to the field of furniture design. Inspired by the classics of Scandinavian design, they began a series of experiments with the goal of creating a perfect dining chair for the modern American. Maybe surprisingly, maybe not, the famous designer couple found the perfect material for their idea in the industrial production of the time – plastic. 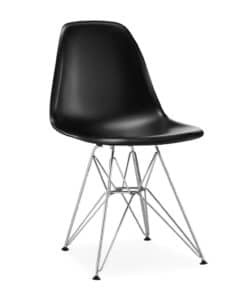 By using plastic and at the time state of the art industrial processing techniques, Charles and Ray Eames managed to create a series of dining chairs which were lightweight, simple to clean, durable and on top of that, stylish and almost sculptural in form. As such, they were a perfect addition for any American home. Without compromising the core demand of functionality, the Eames couple turned their dining chairs into expressions of style and symbols of simple elegance. 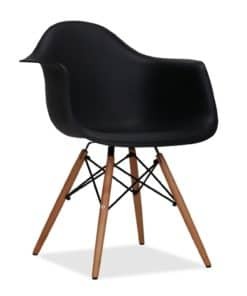 In our offer, you can find highest-quality reproductions of some of the most iconic Eames plastic chairs – from cozy DSW and world-famous DSR chair with its characteristic shell and Eiffel tower base, to DAW and DAR armchairs and their rocking chair variant RAR. If you appreciate functionality and simplicity, but still demand style and elegance of the timeless classics of Scandinavian designer furniture, our plastic dining chairs replicas inspired by Eames timeless designs will certainly meet your needs. With their clean and simple geometry, almost minimalist aesthetics and a unique stylistic touch, Eames plastic dining chairs can easily fit in with numerous contemporary interior design styles and preferences and they still remain a perfect addition to any stylish home. With the same demands that shaped the original spreading to other spheres of life, today you can find these models not only in countless dining rooms throughout the world, but also in offices, lobbies, coffee shops and any other space in need for a subtle, yet undoubtedly elegant touch.